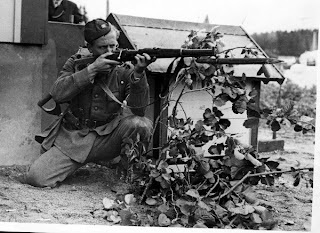 This is a cool pic published at helsingborgs dagblads website, showning a swedish soldier with his m/94 swedish mauser carbine. To be absolutely sure not to get hit by mortar fire, he hides behind what looks like a doghouse! I took the buttplate off my latest acquisition and there's the little tag with the name of the soldier who owned it. Appears to be a Swiss address.. Someone mentioned a site where one could look that sort of thing up. Any ideas? You mean a swedish adress? Shoot me an email with the details at rickenbacker666 at hot mail, and I´ll try to sort it out.